Below, you'll find information that will help you get to know us better. From awards and credentials we've achieved, to references from past clients. We consider the satisfaction of our clients to be our greatest achievement, and take pride in our high volume of repeat business and referrals. Call us today. We'd love to add you to this growing list! My sincere thanks for all you did helping to sell my house and the help you gave me buying this one. I couldn't have done it without you. I will certainly recommend your excellent services to others. Carla made purchasing our first home as stress free as possible. We kept wanting to go above our budget but Carla showed us the possibilities of purchasing within our budget and we really appreciated that. Looking back it is the best house for us and we are not stressing over an unrealistic mortgage payment. We love the area and our neighbours. It was nice to have an all in the family service as her brother in law was able to do our mortgage and we had Bob to give us feedback as well. We recommended this duo to our friends who sold and bought a house too! Carla gave us time, didn't pressure, and made us feel important. We have already recommended her to a friend! 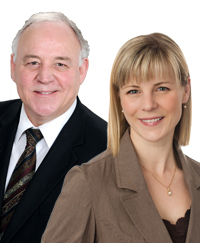 I would not hesitate on recommending Bob and Carla to family or friends when looking for local realtors. We have a young family and we were very happy with the service provided as they were able to work around our schedule. The selling and buying of our new home has been a very positive experience, thanks to this pair. Bob and Carla had an excellent knowledge of the property and neighbourhood and seemed approachable, sensitive, friendly, and had an understanding attitude. I was confident it their abilities and knowledge. They even were willing to help with small home repairs. We've used Bob 10+ times over 30+ years! Bob's knowledge of current market trends and prices is excellent. He demonstrated a genuine interest in our needs and responded promptly to our requests and concerns. Bob is confident. There is nothing that he could have done to proivde better service to us and we would reccomend him to family and friends. "They were genuinely interested in my needs and spent extra time outside of office hours to accomodate my wishes." When this family was asked how they felt about our service and whether or not we did anything special, they responded, "very good... highly appreciated... many (sic) useful information". When asked if they would recommend Bob and Carla to family and friends, they answered, "absolutely YES". "I would not hesitate to use Bob and Carla again. They were always available and ready to look at houses. I can't think of anything they could've done to provide better service". Bob and Carla were both great and we will recommend them to family and friends! "He's a good friend, we thought he was great. He kept us calm... and positive!" "We feel very well and confident. Bob arranged everything to match our needs. We had only one week for our 'House Hunting Trip', as we were moving to Ontario. He did everything possible. We are very satisfied." "Bob did a great job!! He even cut my grass when I was not able to. Thanks Bob." "Bob took the time to show me many houses and did not pressure me. He knew that I would not respond to buying pressure, so he didn't do it. His knowledge in all areas of Maple Ridge is very impressive. He knows houses as well as amenities in all areas." "Bob was polite and courteous. He was helpful in answering our many questions and even got our insurance lined up." "Bob was trustworthy, honest, and helpful. Since we were first time buyers, it was harder for us to comprehend certain areas and he was very helpful in giving us advice." "Bob was fantastic! He was a tremendous help to us. He went above and beyond in helping to arrange carpeting of our new place." "Bob was very confident and always available."